A major design issue in multi-board systems is how to connect everything together. Whether you’re working with blades inserted into the backplane, mezzanine cards on a motherboard or connecting board-to-board with cable, the connector interface choice is critical. Recently released are the SEARAY ™, HD Mezz ™ and DP Array ™ families of high density interfaces. 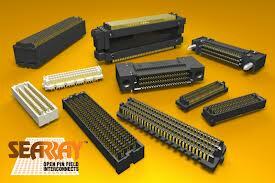 The SEARAY™ is an open pin field array with up-to 500 pins. Suitable for backplanes and board-to-board, the connector pin design has the flexibility to route as differential pairs, single-ended, or a combination. Maximum signal frequency is 10.5 GHz when routed for differential pairs. Mating is low-insertion and can be “zippered” when un-mating for low-extraction force. This family is available in both straight and right-angle configuration and is footprint compatible with the earlier SamArray ™ family. The HD Mezz ™ is another open pin field array which provides more inter board clearance, with elevated stack height up to 35mm. Connectors support a maximum of 299 I/Os and are rated for 9.5 GHz single-ended. This connector family is compatible with Molex HD Mezz ™ family. Developed specifically to address the needs of high pin count differential connectivity is the DP Array ™ product line. These support a maximum of 168 pairs in a 17mm stack height. The staggered pin layout eliminates the need for ground-path and return-paths, simplifying the board layout complexity. Ground routing is accomplished through perimeter routing. When your design requires high-speed interconnects and transmission-line-solutions, Samtec has a solution. Network and communications designers have used these in Servers, Routers, Hubs, Switches, Network Systems, High End Computers, Test and Diagnostic, and RAID Drivers/Controllers.